55 gallon for two single tails? There seem to be a wide range of opinions on this topic, so I thought i'd get a sampling of them. Is a 55 gallon tank going to be big enough long-term for a comet and a shubunkin? If not, and I get them as babies, about how long should they fit before I need to upgrade? Looks like someone's going Fish Shopping!!!!!!!!!!!!! Yep should be plenty for room. Even a little extra left over. 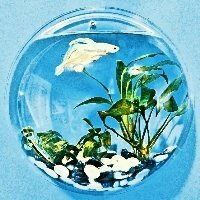 The recommendation on this site is 20gal/fish no matter if it's a fancy or single tail. Sounds like there is room for a bristlenose pleco or some snails. Enjoy. I 2nd the Bristlenose Pleco idea!! They are great little fishies!!!! Haha, I'd love a bristlenose, but might have to consider a heater first-- the goldie tank usually stays a bit below 70 They're the cutest though, so maybe someday!! If you do get a bristlenose, get an albino BN. They are the smaller BNs. I prefer a female albino BN because they are less territorial than the males. Bn or rubber lip both will work but I've not had much success with rubberlips. BNs are cool I have two in an 80gal one albino male and a green dragon female. I personally like the green dragon more. Oh both are the long fin varieties that I have. They also have a red one now but they are a bit $$ for me.